Dorothy E. Johnson was born on August 21, 1919 in Savannah, Georgia. She earned her Bachelor of Science in Nursing in 1942 from Vanderbilt University in Nashville, Tennessee. In 1948, she received her Master's degree from Harvard University. During her career, Johnson was an assistant professor of pediatric nursing, an associate professor of nursing, and a professor of nursing at the University of California in Los Angeles. She retired in 1978. Theory Development: What, Why, How? 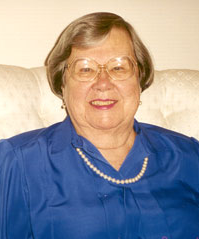 Johnson is known for her Behavior System Model of Nursing, which was first proposed in 1968. The model advocates the fostering of efficient and effective behavioral functioning in the patient to prevent illness. The patient is defined as a behavioral system composed of seven behavioral subsystems. Each subsystem is comprised of four structural characteristics. An imbalance in each system results in disequilibrium. The nurse's role is to help the patient maintain his or her equilibrium. Johnson's theory of nursing defines nursing as "an external regulatory force which acts to preserve the organization and integration of the patients behaviors at an optimum level under those conditions in which the behavior constitutes a threat to the physical or social health, or in which illness is found." To assist the patient whose behavior is proportional to social demands. To assist the patient who is able to modify his behavior in ways that it supports biological imperatives. To assist the patient who is able to benefit to the fullest extent during illness from the physician's knowledge and skill. To assist the patient whose behavior does not give evidence of unnecessary trauma as a consequence of illness. The assumptions made by Johnson's theory are in three categories: assumptions about system, assumptions about structure, and assumptions about functions. There is "organization, interaction, interdependency and integration of the parts and elements of behaviors that go to make up the system." A system "tends to achieve a balance among the various forces operating within and upon it, and that man strive continually to maintain a behavioral system balance and steady state by more or less automatic adjustments and adaptations to the natural forces occurring on him." A behavioral system, which requires and results in some degree of regularity and constancy in behavior, is essential to man. It is functionally significant because it serves a useful purpose in social life as well as for the individual. "System balance reflects adjustments and adaptations that are successful in some way and to some degree." "from the form the behavior takes and the consequences it achieves can be inferred what 'drive' has been stimulated or what 'goal' is being sought." Each individual person has a "predisposition to act with reference to the goal, in certain ways rather than the other ways." This predisposition is called a "set." Each subsystem has a repertoire of choices called a "scope of action." The individual patient's behavior produces an outcome that can be observed. There are three functional requirements for the subsystems. The system must be protected from toxic influences with which the system cannot cope. Each system has to be nurtured through the input of appropriate supplies from the environment. The system must be stimulated for use to enhance growth and prevent stagnation. These behaviors are "orderly, purposeful and predictable and sufficiently stable and recurrent to be amenable to description and explanation." Johnson's theory defines health as a purposeful adaptive response to internal and external stimuli in order to maintain stability and comfort. The main goal of nursing is to foster equilibrium within the individual patient. The practice of nursing is concerned with the organized and integrated whole, but maintaining a balance in the behavior system when illness occurs is the major focus of the career. The nursing process of the Behavior System Model of Nursing begins with an assessment and diagnosis of the patient. Once a diagnosis is made, the nurse and other healthcare professionals develop a nursing care plan of interventions and setting them in motion. The process ends with an evaluation, which is based on the balance of the subsystems.